This text/poem is attributed to Charlie Chaplin but there is some discussion whether this is true or not. I stopped designing huge projects for the future. everything the drew me down and away from myself. it can make me sick. my mind became a valuable ally. There is also a YouTube version by Adrea Bezerra. While the code for our game is simple enough, it’s starting to get messy. movePlayer() contains code to move the player, the enemies and the collision detection. Also, the game ends when you win. There is no way to restart. I could add that but it would make the code … ugly. Time to refactor. Refactoring, in a nutshell, means to change the internal structure of the code without changing the behavior. Sounds futile? Nope. The goal of refactoring to make the code easier to maintain and extend. Right now, the some code related to enemies is in the Enemy class but code for the player is spread all over the place. Time to create a Player class. That looks much better. Next, we’ll have several states that the game can be in: Intro, game running, game over, high score. They all have similar properties: They respond to keys and they draw something on the screen. With the current code, that would be clumsy to implement. While this is much more code than before, it has the advantage that I don’t have to stop the main loop anymore. Which means I can add a nice death or victory animation with little effort. While trying this version, I noticed that I forgot to reset the score. Actually, the scoring is part of the main game loop, so I can move all the code related to it into MainGame. To clean up things even more, I’m splitting the code into several tabs. Since the project has now reached a certain complexity, I’m moving to version control with Git. If you don’t know what Git or distribute version control is, I suggest to read this article. Or you can try it online. The whole project can be cloned from here. The version of this blog post is tagged with v8. With the new cleaned up code, we can easily add an intro screen. Writing Games with Processing: Highscore! What’s a game without a score? Boring! Luckily, adding scoring to our game is a piece of cake. We just count the number of moves that Platty survives. That’s it. Can you beat my high score? That’s it. Complete game in 210 lines of code. Next: Time to clean up. Now that the player can lose the game, he needs a way to win. One idea we had was that crocodiles are greedy: When they run into each other hunting Platty, they start to fight over the food. As you can see, I added an inner loop to check if the current enemy is close to any other enemy (except itself, that’s why there is a second list). I also count how many enemies are currently not in a fight. 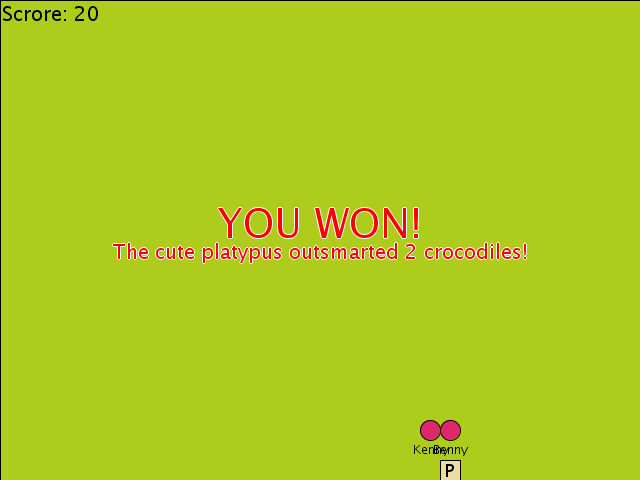 If you try the code from the last session, you’ll notice that the crocodiles can reach Platty but the game doesn’t end. We’re missing collision detection. Following our KISS mantra, the collision detection should return true if a crocodile is “next” to a certain tile position (i.e. the distance in both x and y must be <= 1). Hm… that’s not right. 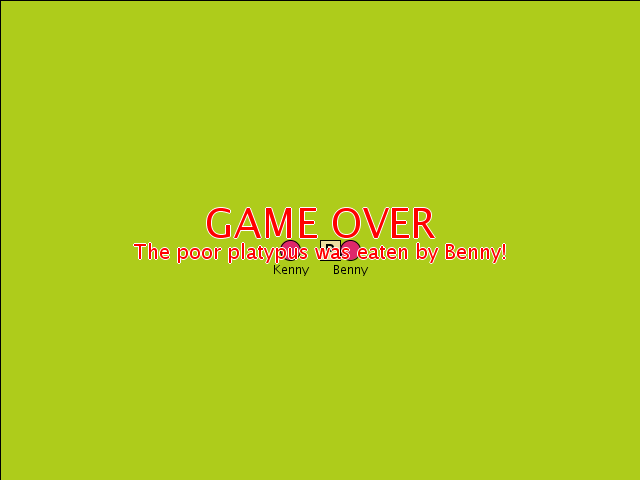 Benny should eat Platty one step earlier. Notice how the enemy name makes debugging much easier. Much better. And don’t forget to disable the debug output! Now that we have a way to lose the game, we should add a way to win. As it is, the game is pretty boring. The player has some control but no goal. Let’s add a routine which makes the enemies hunt the player. There are many complex algorithms for path finding but we aim for something simple. Which leaves us with the last problem: When should the crocodiles move? One solution would be to move them in draw(). If you try it, you’ll see that this makes it a pretty short game – the screen is refreshed about 60 times per second but the key repeat is only 20 times per second, so poor Platty is eaten after a single step. You are currently browsing the Dark Views blog archives for December, 2013.